A whole different kind of hairbrush, RAINCRY’s ultra-luxe ‘Magnesium Volumizing’ range is designed to heat the hair and create volume, handcrafted in Italy from premium nylon bristles and a magnesium alloy core. The ideal match for your hairdryer and a hair-healthy alternative to tongs and rollers, the clever metal core heats and cools faster than ceramic, helping to lock in style and reduce damage so that you can (finally!) get a salon-worthy finish at home. This medium size is ideal for mid-length (above the shoulders) hair. 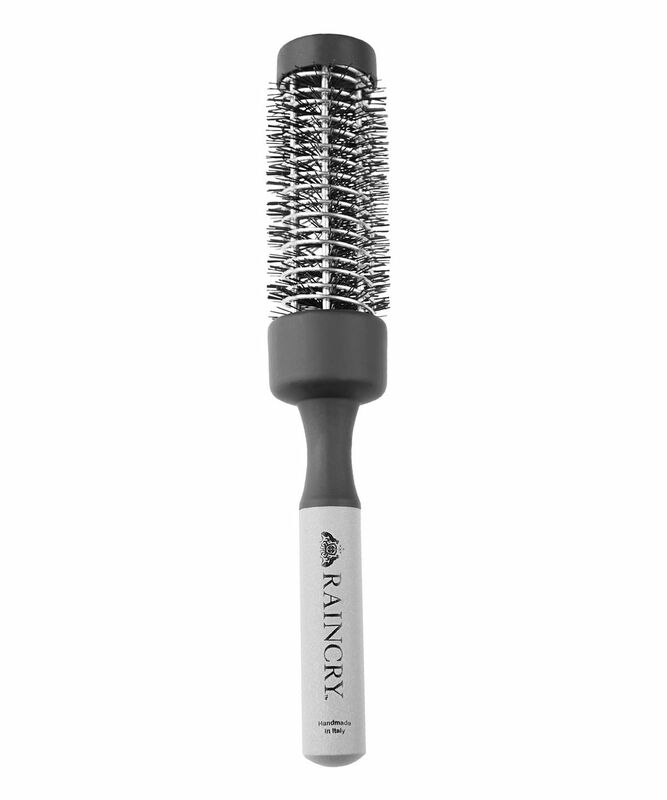 An essential addition for all those ‘in the know’, RAINCRY’s VOLUME - Magnesium Volumizing Brush - Medium will make you wonder why you’ve ever had another hairbrush. Created thanks to the combined brilliance of stylists’ expertise, cutting-edge technology and timeless craftsmanship, this brush is handmade in Italy from premium nylon bristles – which remove excess products and oil to prevent hair from being weighed down and boost volume – and an innovative magnesium alloy core. This masterful metal provides the thermal styling benefits – it heats and cools faster than ceramic, helping to lock in any style and reduce heat damage, making this a healthier alternative to tongs or rollers. The special spiral design of the brush head increases the heating surface and channels the air around it effectively, reducing blow-drying time and preventing snagging and damage. This medium (1.8” / 45mm) size is ideal for mid-length (above the shoulders) hair – brushing it will never be the same again! This thermal brush is designed to heat the hair and create lift and volume. Synthetic (nylon) bristles are known to remove excess product and oil from hair, preventing it from being weighed down thus enhancing volume. Start at nape of neck and section hair to the same width as the brush. Place brush under the section (at the roots) and heat the hair at root area until dry and then pull brush upwards away from shoulders drying the mid-shaft while still pulling away from shoulders. Twirl the ends like “spaghetti” to get a great finish. Be sure to cool each section fully before moving on to next section. This brush is wonderful. My hair is dried even faster using this, thanks to the way it conducts heat, with such a silky finish. Loving using this.